Skiers ascend Elephants Back at Carson Pass. Ascending backcountry and resort slopes has become more popular in the last few years. 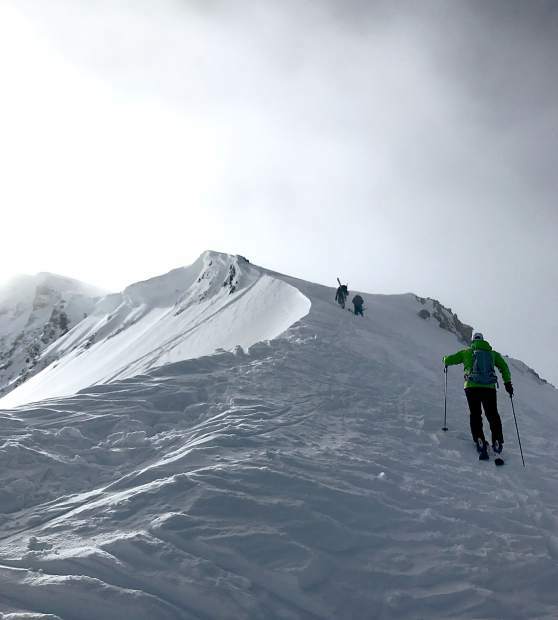 The popularity of skiing/skinning uphill in the backcountry has taken off over the past few years, but it’s not exactly limited to the backcountry. People also are using ski resorts to get in their conditioning needs before, or after, hours in the cool, crisp winter air. As more uphill travelers use leg power to climb the snowy slopes, resorts have crafted rules to keep them as safe as possible. And when it comes to safety, travelers are always advised to use common sense when making decisions. Other than dialing 9-1-1, there are no emergency services there to help outside of operating hours. The policies are similar but vary at each resort. Some of the basic rules to follow include, don’t ascend during hours of operation, travel in single tracks in groups and stay to the side of groomed surfaces, wear lights and bright clothing that reflect, give anything with an engine a wide berth, don’t pass into closed areas, man’s best friend is best left at home, and all travelers accept responsibility for their safety. Kirkwood and Heavenly Mountain resorts have posted trail hotline phone numbers on their respective websites to use prior to hiking. The online policies at Kirkwood (http://bit.ly/2F4Lpg3) are detailed. Dogs are not allowed and the resort suggest hikers position themselves so they are visible from above; there usually are no groomed surfaces that reach the summit. Kirkwood is especially prone to avalanches and mitigation may be in the process during the early morning hours after, or during, storms — especially with a heavy-hitting storm like the Tahoe Basin is experiencing to end this week. According to the Heavenly trails and uphill access hotline, there is no uphill access from the California base lodge. But hikers may ascend trails from the Stagecoach and Boulder base lodges from 6 p.m. to 6 a.m. The Heavenly hotline is 530-542-6922 and the Kirkwood number is 209-258-7444. Sierra-at-Tahoe doesn’t have a posted uphill policy on its website, but the resort is partners in recreation with the El Dorado National Forest. Some resorts located on private land have no uphill access like Squaw Valley / Alpine Meadows. Michael Reitzell, president of the California Ski Industry Association, says resorts on private land can set their own rules while resorts that partner with the Forest Service can restrict access for safety reason, but not much else. He also said that people who have reached the level of skinning up mountains should know what they are doing when it comes to staying safe. Diamond Peak on the North Shore is a community-owned resort on mostly private land and requires an uphill access season pass, which is available for no cost (http://bit.ly/2F2CD6c). Diamond Peak marketing manager Paul Raymore said uphill access is a privilege and one the resort is happy to provide for a lot of their users. He also emphasized how conscientious uphill travelers need to be of grooming and snowmaking equipment. If the rules are not followed, uphill access will be reevaluated, he said.